This has been lying in my drafts since long time....Pickles time....My in laws like pickles a lot, so this Lemon Pickle is for them. Even though I don't eat pickles, I have stock for my family. Wash, wipe and cut lemon into small squares. In a glass bowl or porcelein bowl, add lemon, salt and red chilli powder. Mix and leave it for 1 to 2 hours. Then season it with oil, mustard wait till it splutters. Off the stove add Hing(Asafotida) and venthaya podi. Mix well and leave it for a day. Keep mixing in intervals with a wooden or plastic spoon. Yummy Lemon Pickle is ready. A perfect for curd rice/Kootu rice. - For longer shelf life store in refridgerator. - If you are using steal spoon, do not leave it in the box as it will rust. 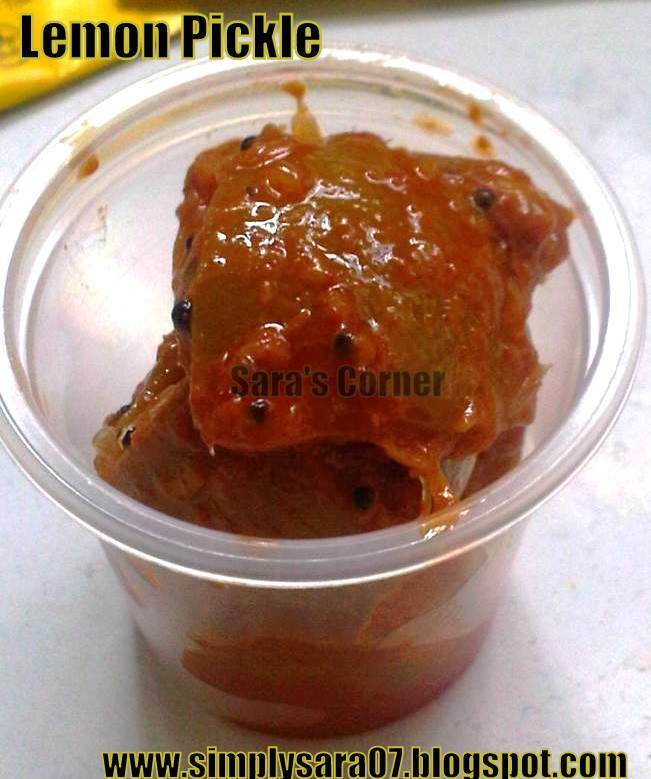 Wowwwww... mouth watering pickle .. looks awesome !! Ahh ~ it looks mouthwatering! Perfectly done. I loveeee this pickle...mouthwatering with hot rice rice n ghee..
Mouthwatering pickle. I love it. Mouthwatering pickle just need some yogurt rice. I don't enjoy eating pickles but this looks so good.